Pump Relays - Micro-Air, Inc. 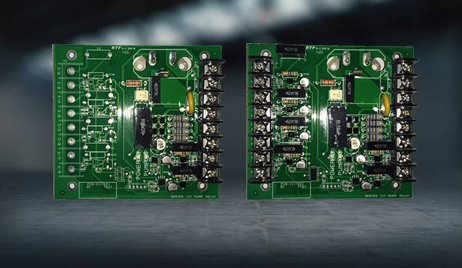 These Pump Relay (PRP) boards allows control of a common seawater pump between multiple cabin or chiller controls. It can also be used to control a common chilled-water loop pump between multiple chiller controls. Separate, fully-isolated pump trigger inputs accept either 115VAC/60Hz or 230VAC/50-60Hz. The pump power source and pump output is also isolated and can be either 115VAC or 230VAC/50-60Hz. Two models of PRP are available, one that can support up to 2 trigger inputs, and one that can support up to 6. PRPs are also available enclosed in a metal electric box.